From time to time we like to bring you a comparison between two hot devices and today we’re looking at the Apple iPad mini vs Samsung Galaxy Tab 3 7.0 in a specs contrast. The iPad mini released last November to instant success while the Galaxy Tab 3 has just been officially announced with a release from May. These will be natural competitors so we’ll give you a rundown of what they have to offer. The iPad mini comes as either Wi-Fi or Wi-Fi Plus Cellular models while the Galaxy Tab 3 Wi-Fi version is scheduled to release in May with a 3G version due in June. We’ll show you some of the key specs and details next to show how they compare. The iPad mini has a the 1GHz Apple A5 dual-core processor while the Galaxy Tab 3 has a 1.2GHx dual-core processor. Both devices have smaller displays than earlier tablets so that the iPad mini has a 7.99-inch LED-backlit IPS LCD display with resolution of 1024 x 768 and 162 ppi. On the other hand the Galaxy Tab 3 has a 7-inch TFT display with resolution of 1024 x 600 and 170 ppi. The iPad mini has 512GB of RAM and either 16, 32 or 64GB internal storage (non-expandable). The Galaxy Tab 3 has 8 or 16GB of internal storage but this is expandable via microSD up to 64GB. There’s a 5-megapixel rear camera with the iPad mini with autofocus, 1080p video capture and video stabilization plus a 1.2-megapixel front-facing camera with FaceTime over Wi-Fi. On the other hand the Galaxy Tab 3 has a 3.15-megapixel rear camera with autofocus, LED flash and 720p video recording and also totes a 1.3-megapixel front-facing camera. The iPad mini includes Wi-Fi 802.11 a/b/g/n dual band, Bluetooth 4.0 with A2DP and ESR and USB 2.0 while the Galaxy Tab 3 HAS Wi-Fi 802.11 a/b/g/n with DLNA, Wi-Fi Direct and dual band, Bluetooth 3.0 with A2DP and USB 2.0. The iPad mini runs iOS 6.0, upgradable to iOS 6.1.3 while the Galaxy Tab 3 will launch running Android 4.1 Jelly Bean and will also feature Samsung’s TouchWiz UX UI. The iPad mini measures 200mm x 134.7mm x 7.2mm and weighs 308g for the Wi-Fi version while the Wi-Fi + Cellular option has the same dimensions but is very slightly heavier at 312g. It comes in two color options, black and slate or white and silver. 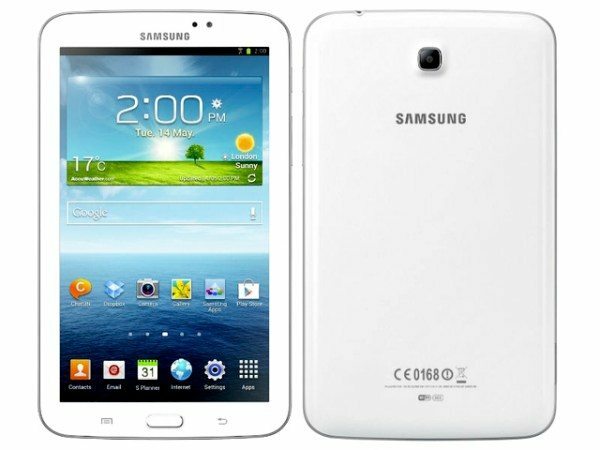 The Galaxy Tab 3 measures 188mm x 111.1mm x 9.9mm and weighs 302g while the 3G version is 306g. This one is only available in white. We cannot compare prices yet as no pricing has been announced for the Galaxy Tab 3 so far. However we can tell you that the Wi-Fi version of the iPad mini from Apple is priced at $329, $429 and $529 respectively for the 16, 32 and 64GB variants. The Wi-Fi + Cellular model is priced at $459, $559 and $659 respectively for those same variants. Although we cannot detail every single specification or feature for both of these tablet devices we hope that there’s enough here for you to see how they match up against each other. It will certainly be interesting to see how the Galaxy Tab 3 sells when it is launched. There should also be an iPad mini 2 release later this year but no date has yet been confirmed. The popularity of the iPad mini is already proven and we can’t say we’re too excited about the specs for the Galaxy Tab 3 although it will certain find buyers. Your choice may depend on what is most important to you in a tablet. The iPad mini camera set-up is certainly more impressive than for the Galaxy Tab 3 and it also comes in higher internal storage options. However the Galaxy Tab 3 does have expandable storage and another factor in your decision may simply be the choice of iOS or Android operating system. We’d like to know your thoughts on these two tablet devices. If you had to choose one right now would you opt for the iPad mini or Galaxy Tab 3? What price would you be willing to pay for the Galaxy Tab 3? Let us have your comments. I got one. Apple loses. Overpriced, no expandability, lackluster features. Can’t at all compete with this product for the price.